Three alternatives were considered in the land use alternatives process. The City Council favored Alternative C with some modifications (see next image). 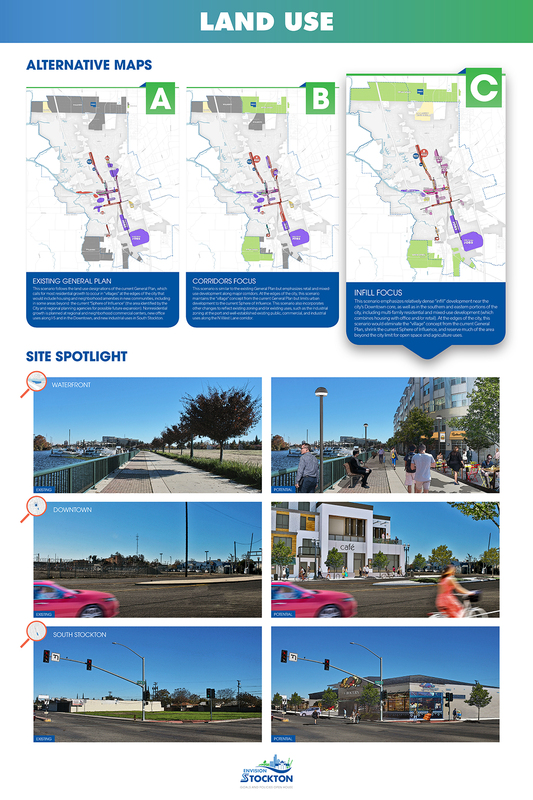 This image shows visual simulations of potential development under Alternative C at three locations in Stockton. 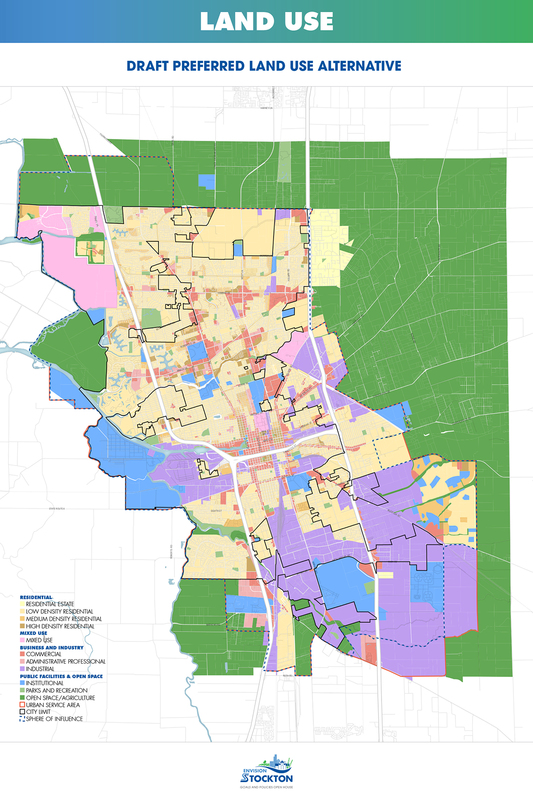 This land use map is based on Alternative C, with some modifications directed by the City Council. 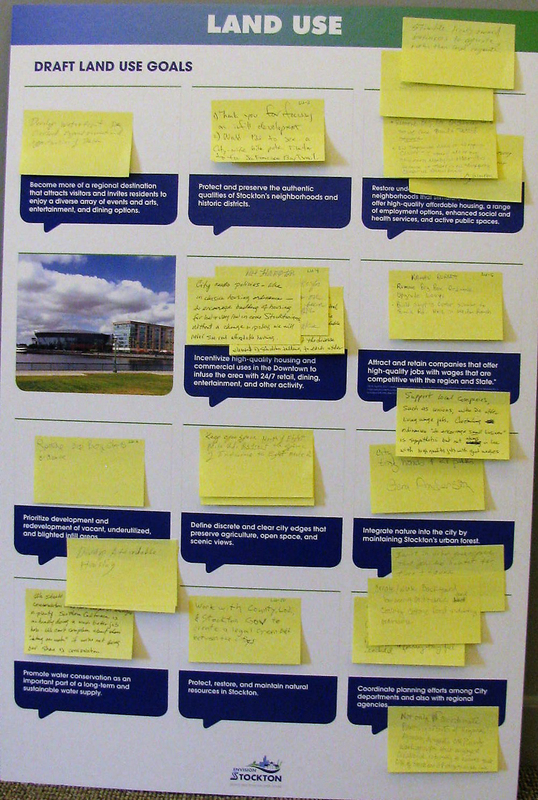 Comments made at the May 1st and 2nd open houses related to land use. Become more of a regional destination that attracts visitors and invites residents to enjoy a diverse array of events and arts, entertainment, and dining options. Protect and preserve the authentic qualities of Stockton’s neighborhoods and historic districts. Restore underserved areas into vibrant neighborhoods that stimulate investment and offer high-quality affordable housing, a range of employment options, enhanced social and health services, and active public spaces. Incentivize high-quality housing and commercial uses in the Downtown to infuse the area with 24/7 retail, dining, entertainment, and other activity. *At its April 4, 2017 meeting on the land use map, the City Council directed that the General Plan provide flexibility for a major employment and economic generator to locate in the area north of Eight Mile Road. This goal will include a policy to respond to this direction. Prioritize development and redevelopment of vacant, underutilized, and blighted infill areas. Define discrete and clear city edges that preserve agriculture, open space, and scenic views. Integrate nature into the city by maintaining Stockton’s urban forest. Promote water conservation as an important part of a long-term and sustainable water supply. Protect, restore, and maintain natural resources in Stockton. Coordinate planning efforts among City departments and also with regional agencies.